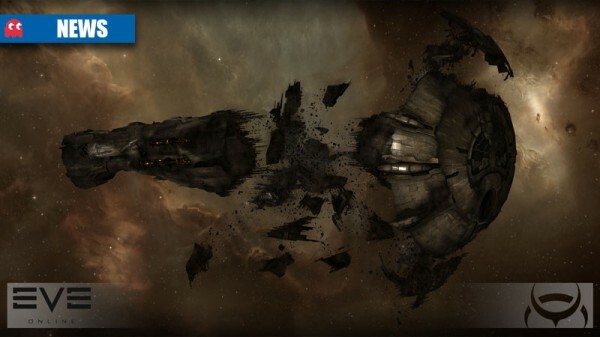 The largest battle in the history of EVE Online took place last month on January 27, 2014. 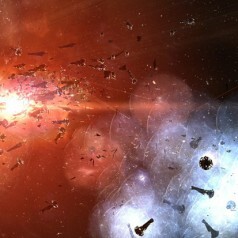 EVE Online is a game built on war and destruction but this battle (dubbed the Bloodbath at B-R5RB) was so massive in scale that it caught the attention of mainstream media outlets like Forbes, BBC News and CBS News. Why such interest for a battle in a video game? Well it probably has something to do with the fact that the total damage is estimated at somewhere in the ballpark of $300,000 USD. The battle’s monetary destruction is what caught the eyes of the media but beyond just the money, this battle represents a culminating moment in a fascinating, unique user-generated history. Released in 2003, EVE Online has had a strong in-game community for more than a decade now. It has an intricate and complex in-game economy and this economy encourages players to steal, attack and destroy other players and their alliances. What is most interesting about EVE Online though is that the game is largely player-driven. Players forge alliances and wage war against other players. Some of the battles that take place are small skirmishes and some alter the landscape of the world permanently. What makes EVE different from other Massively Multiplayer Online (MMO) games, the players create the world around them. For eleven years, users have actively spawned the major events and lore of this universe. Released in 2004, World of Warcraft (WoW) is likely the most popular MMO game of all time. At its peak, 12 million people played WoW. With WoW, the quests that get completed and the player-vs-player battles that occur have no lasting affect on the environment around them. The developers of the game create the lore and backstory of the land of Azeroth, not the players. For example, the newest area to explore in Azeroth is Pandaria, which was made available as part of the Mists of Pandaria expansion pack. With this new land though, the quests and activities that can be found were all created by the developers and even the way that the players interact with each other is all developer controlled. Moving back to EVE, because player alliances are able to control systems the wars that take place forever alter the geopolitical landscape of the game’s universe, New Eden. This is not done on a small scale either. There are more than half a million subscribers to EVE Online that are actively creating a tangible history of New Eden. The alliances that fight in EVE are massive in size as well. Two of the biggest coalitions, the ClusterF**k Coalition (CFC) and the N3 Coalition (N3C), were two of the parties involved in the aforementioned battle. According to this series of graphs and charts from Dingo’s FC Toolbox, CFC currently sports more than 36 thousand members and N3C coming in with just over 24 thousand. The combined size of these two coalitions exceeds the population of Greenland. After more than ten years of EVE, players obviously realized that their ever changing world needed a recorded history, not just oral tales. With this, battles and wars are given names similar to Earth’s history. For example, EVE has had a number of Great Wars, with the most notable of them, the Second Great War, taking place over a period of three years with more than 30,000 players involved. The history of these wars has been recorded on a number of sites including the EVElopedia, Truestories and alliance’s personal websites such as GoonSwarm’s (the biggest corporation in EVE with more than 12,000 members) website, the Mattani. By finding these pages, a non-EVE player can learn about some of the important leaders and events that have occurred in EVE‘s history. These pages also show how the history of this world can come from different sources. GoonSwarm’s website is an example of a first-hand account of history. GoonSwarm was the largest victor of the Second Great War and so their account of what happened is subject to doubt. Meanwhile EVElopedia’s article on the Second Great War and the larger account from Tentonhammer.com attempt to be much more neutral but the GoonSwarm influence can sometimes be seen on these types of histories. The opposing side of the Second Great War, the Band of Brothers (BoB), was disbanded shortly after the war and no longer have a website. An interesting display that history truly is written by the victors. Play the Past has explored game created histories before. Trevor Owens wrote a couple years back about reconstructing the past in Fallout 3 and my first ever post at Play the Past was on Zelda historians canonizing the series’ timeline, so it is not uncharacteristic to find histories within video games. What is different about EVE is that the history is player-created and therefore, in a way, is a form of microhistory because the history of New Eden is made up of events and wars that are real and human, not works of fiction created by a developer. It is unlikely that EVE Online will last longer than another decade but for a moment imagine it does. Who knows exactly what happens but in 2023, CCP shuts down the servers for EVE Online forever. That will leave twenty years of raw human history that will need to be cataloged and organized with events like the Bloodbath at B-R5RB, the rise of GoonSwarm and the disbanding of the once great Band of Brothers. The reason that I mentioned the Bloodbath at B-R5RB at the start of this post is it was one of the biggest events in New Eden’s played history. To honor this battle and the immense destruction that took place during it, the developers of EVE (a company called CCP games) are putting a memorial where that battle took place. Much like how there are Vietnam War, Second World War and First World War memorials, the EVE Online community is paying tribute to their history. Historians may eventually look at online memorials and the memorial for this battle “Titanomachy,” may be the first of its kind. So the Eve-online community is developing a sensibility for the historical experience of war. They put up memorials as “lieux de memoire” to make the conflict part of their commemorative culture. Why do they do this? Because they want to feel as a community, forged by its history. Because they feel that their virtual culture lacks aspects which really matter to them on an emotional level of individual identification with their community. But is this the right way to imagine a community in a virtual environment? The fascinated view on this online culture sometimes lets us forget that the virtual world is decisively limited particularly regarding issues of life and death. They can put up memorials, historiographies and myths of heroism. They even can burn thousands of dollars in a few minutes – they never will truly experience what war is. War in reality is not only burning money. This has been proven by World War I, which the “real world” memorises this year as the horrifying birth moment of concepts like “Europe’s meat grinder” or “the Blood Pump”. War is existential horror, pain and real, final death to a lot of people. All those aspects are not part of the simulation in games like Eve-online. And of course, they shouldn’t be – an essential aspect of any simulation is the removal of actual health risks. By equalising this kind of virtual War memorials with real War commemoration, we risk to internalise the questionable tendency to hide the horrors of real war behind redacted media coverage, the fairy tale of clean precision strikes executed by high-technology and the far spread notion that war is just a question of superior resource-availability. All these propaganda-lies exist in modern societies since WWI to ease the fear of military conflict. In this regard, games play an important role to reproduce such world-views, which in the case of Eve-online is the ultimate cynicism of a utopian modernity: People who die are reproduced as clones, continuing the same wars and joining the same power blocs as their former selfs. The only reason to exist in Eve-online is to trade, to gain resources and to use them to dominate others. I never heard of any player who just tended to his hydroponic gardens because he just liked flowers. Gamers will not find their virtual culture satisfying as long as they will not begin to critically question the design philosophy of their virtual ideal world. Merely copying commemoration practices of the “real world” can not be a satisfying answer. I checked your data. The figure of half a million subscribers is misleading. There are not 500 000 ACTIVE subscribers to Eve Online, something I can attest to as an active subscriber. I can believe that 500 000 accounts have been made since the game left beta in 2003, but the vast majority of those are inactive. For myself I have been responsible for around 6-7 different accounts, of which only two are currently active. The populations of the in-game alliances are further skewed by the fact that each account has three different character slots attached to it. Based on what I know about my regular play in the game, I would be surprised if there were 150 000 real people actually playing the game. Most of us just have (and are possibly running at the same time) two or more accounts. Furthermore, the actual monetary value of in-game currency to USD is massively skewed. PLEX, the in-game object which grants subscription time, has a set price which you can purchase (approx. $20 USD, which hasn’t changed in some time now), but the value of PLEX in-game currency is extremely volatile, and in fact has doubled since 2011, a rate of inflation that would be insane in any kind of real-world economy. Good article, but needs some research done before writing.